Renovation took more time than to build it, but finally, after 10 years, the Rijksmuseum reopened to the public on April 13th, 2013. The museum comes out totally transformed. 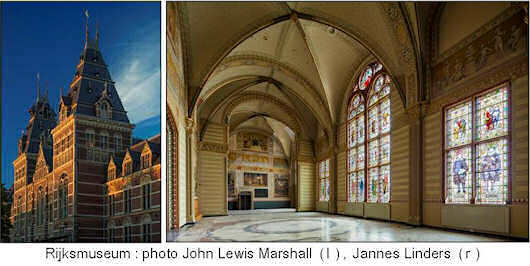 On one side modernised, on the other back to the original design of 19th century architect Cuypers. His exuberant decoration that had been hidden for decades under paint or tapestry, is back in full glory. The presentation is very different now, chronological. With a variety of objects of the same period displayed together. Which is nice, because is puts the object in a context. The 80 galleries, with 8000 objects telling the story of 800 years of Dutch art and history, it all remains too much for one visit. So, some preparation of your visit might be a good idea. Modernisation includes a new spacious entrance, with more facilities for the visitors. And of course, more museum shops. Several new acquisitions on display, like "The 'Golden Bend' in the Herengracht" (1671-72) by Gerrit Berckheyde (below right). Opening hours 9:00 to 17:00 daily, all days of the year. Free entrance with Museumcard, and for age 18 or under. Normal ticket price 17,50 EUR. Direct link to website : Rijksmuseum. Click on image for video section Amsterdam museums.